Sri Lanka has rejected China’s request for its submarine to dock at Colombo next week after a similar visit in 2014 triggered strong protest from India, a senior defence official said, as Prime Minister Narendra Modi began his two-day visit to the country. “They asked for permission for May 14 and 15 to dock in the submarine. We refused,” a top defence official said on the condition of anonymity. 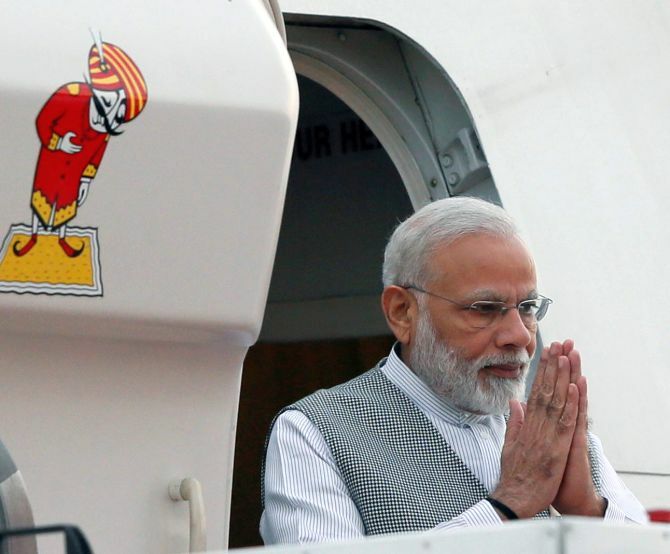 The move came as Prime Minister Modi arrived on Thursday to be the chief guest at Friday's International Vesak Day celebrations, the biggest festival of Buddhists. The docking of two Chinese submarines at the Colombo harbour in 2014 had angered India, which said it undermined its security interests. The government sources said that such requests would be turned down in the future too. The Chinese embassy has so far not responded to the development. India has raised concerns with Sri Lanka over the growing Chinese influence in the island nation. During the former regime of Mahinda Rajapaksa, China funded Rajapaksa’s massive infrastructure development projects with commercial loans for the construction of highways, air and sea ports. His successor Maithripala Sirisena’s plan to handover equity to China as part of the loan settlement have met with resistance. Sri Lanka is currently finalising a plan to lease 80 per cent of its Hambantotata port to China for 99 years. However, the plan has been delayed due to opposition from trade unions.